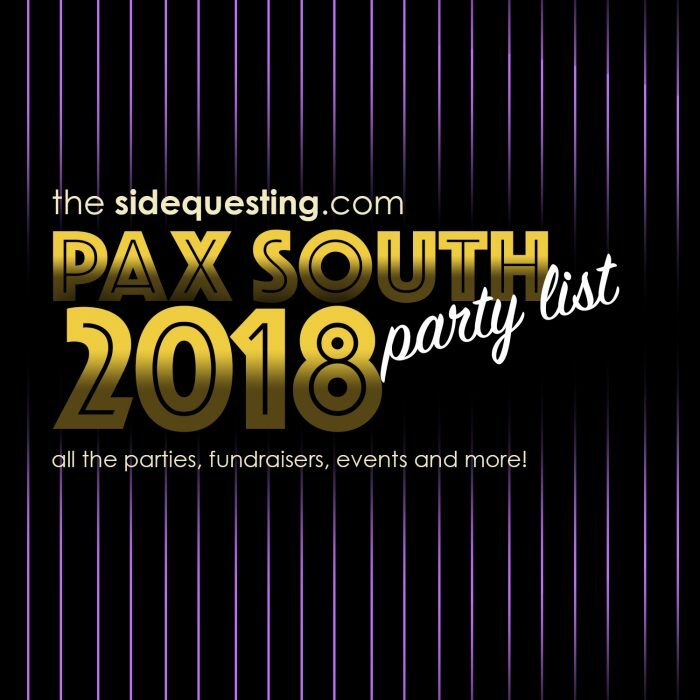 Home » Community » The BIG PAX South 2018 Party List: Parties, Events, and More! Ayyy I know we’re late, VERY LATE, in getting this list up. PAX SOUTH IS THIS WEEK! Have no fear, though. WE MADE IT (just in the nick of time)! Special thanks to everyone in our PAX South Parties group on Facebook, as well as the admins! San Antonio Nerd Night presents Pre-South Gametacular – 4PM-Midnight @ Henry B. Gonzalez Convention Center, Room 006 – Cost: FREE, donations welcome – Info: This year, we’ll be gathering to support CASA – Child Advocates San Antonio. Add a donation when registering, or join in the silent auction there. SAY Sí Teen Game Night – 6:30-9PM @ SAY Sí, 1518 S Alamo St, San Antonio, Texas 78204 – Cost: FREE – Info: Facebook | Feel free to bring your own board games! Food and drinks will be provided. Video games and card games developed by SAY Sí students will be available to play. PAX South 2018 Collegiate Meetup: Powered by Tespa & ROG – 6-10PM @ Hilton Palacio del Rio, 200 South Alamo Street, San Antonio, Texas 78205 – Cost: FREE – Info: Facebook | Free food, drinks, gaming and more! Stream Texas San Antonio Community Meetup – 5-9PM @ Tower of the Americas, 739 E César E. Chávez Blvd, Observation Deck, San Antonio, TX 78205 – Cost: Free, all donations welcome via Eventbrite – Info: Hosted by Dreadnought. Appetizers the first half of the event. Crowfall Meet-Up at PAX South – 6-8PM @ Yard House, 849 E. Commerce St, San Antonio, Texas 78205 – Cost: $5 | Eventbrite – Info: Facebook | Come hang out with Design Lead Thomas “Blixtev” Blair, Executive Producer Gordon “Tyrant” Walton and other members of the Crowfall team during PAX South!